A quantitative approach to monitoring methotrexate levels during treatment of cancer and autoimmune disease. 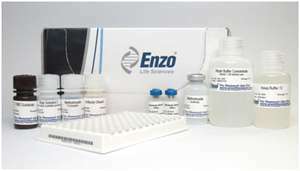 Figure: Methotrexate ELISA Kit from Enzo Life Sciences, Inc.
Enzo Life Sciences expands its offering of unique target ELISA products for cancer and immunology with the introduction of the Methotrexate ELISA kit. Methotrexate is a drug used in the treatment of cancer and autoimmune disease. It is designed as an anti-folate to inhibit the metabolism of folic acid. Monitoring methotrexate levels is important to assure appropriate levels are maintained during therapy or treatment. High levels of methotrexate can lead to toxicity and potential renal failure as well as immunosuppression. Additionally, methotrexate is known to interact with a wide variety of drugs leading to additional complications. Determining the presence of methotrexate in samples from subjects in blinded research studies can assist in the interpretation of study results. The Methotrexate ELISA enables the monitoring of methotrexate levels during treatment of cancer and rheumatoid arthritis. The methotrexate assay is also appropriate for the detection of methotrexate contamination after its use as a selective agent for recombinant protein production in mammalian cell lines. The ultra-sensitive Methotrexate assay allows for detection of as little as 1.4 ng/ml of Methotrexate in human serum and plasma. The assay has also been validated for use in human urine, mouse plasma, mouse serum, rat plasma and rat serum. The ELISA offers a broad dynamic range, reducing the need to dilute your samples. The kits allows for high throughput analysis and time savings through the analysis of up to 38 samples in duplicate in just 90 minutes. The ELISA is thoroughly validated to ensure excellent reproducibility between experiments, and low cross-reactivity with structurally related molecules. The Methotrexate ELISA kit has been validated for human, mouse and rat samples. Like all Enzo Life Sciences ELISA kits, the Methotrexate ELISA kit is complete, flexible, and put through rigorous fit-for-purpose validation and stability testing to ensure high precision, accuracy, sensitivity, and specificity. It is supplied with an easy-to-follow protocol, pre-coated microtiter plate and liquid color-coded reagents to save the user time and reduce errors. The 96-well break-apart strip plate design provides throughput flexibility to minimize waste. For more information or to order the Methotrexate ELISA Kit or other Enzo Life Sciences products, please visit us at www.enzolifesciences.com or call us at 1-800-942-0430.